Understanding social media trends in the previous year and how SM can be the most effective digital marketing method available to your business in 2018. Social media is by far the most popular service available on the internet. It can share information, spread brand awareness – it makes or breaks your business. If you’re not utilising social media effectively, you’re missing out on a whole new potential market of consumers. With a new year upon us, we look back at some of the biggest social media services to date and our predictions for the new year. It’s important to look back in order to move forward. By reviewing what social networks were most popular, we can predict what social sites you should be using in 2018. We’ll also be looking at how to effectively utilise your social media as a marketing tool online. As a full-service digital marketing agency, we’re a big fan of social media and hope you will be too. Think about your typical day. When you get up for work, you check your socials. When you’re at work, you check your socials (albeit it sneakily) and when you’re at home, guess what? You check your socials. Everyone’s daily routine revolves around checking social media at least once a day, and that’s a market that your business cannot afford to miss. The most popular social networking sites are popular simply because of the sheer number of users on those apps. Let’s consider Facebook for a moment and all the data you input into it. Marital status, age, gender, location, interests etc. – they can all be targeted by social media marketing. Which means, if your company is looking to advertise directly to men between the ages of 18-24, living in London, you can use Facebook to target them. Paid promotions mean you’re guaranteed to be seen on a specific users feed, potentially generating more traffic for your site and more business. Most social media platforms can be utilised with paid promotions – including Twitter, Instagram and LinkedIn. Pros – The benefits of SMM cannot be disputed. Direct targeting to an audience and the vast audience that can be reached have been mentioned, but you can also build and establish your brand and brand loyalty. Not only is SMM cost-effective, but data from Facebook insights mean you can see if your strategy is working. Cons – The drawbacks include having to monitor social media closely, making it very demanding and time-consuming. Whilst building brand loyalty and growing on social media is good if it’s not improving your sales than sometimes it can be frustrating. It requires time, investment and patience. 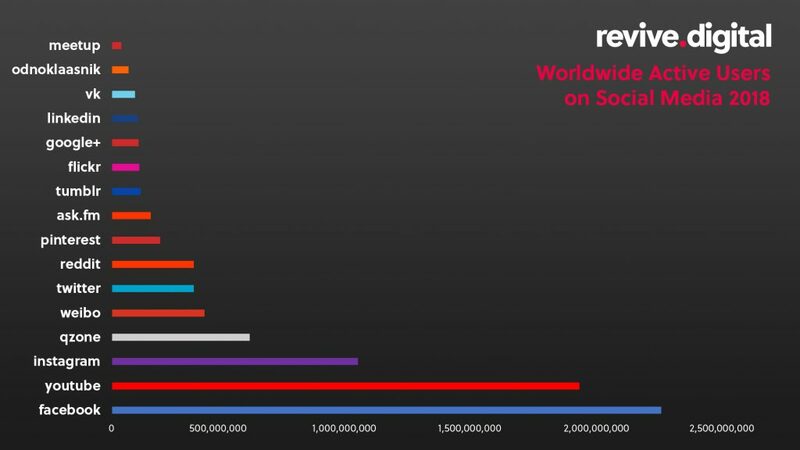 Facebook is still the dominant platform worldwide, along with Instagram and YouTube. However, Qzone is a Chinese social network, yet still has a high volume of users. If you’re a national business, it may be worth looking to target some, if not all, of these platforms. As for the UK, the proof is in the numbers. Social media statistics offer an insight into the millions of users on each social network, in the UK. Are you using all the social media sites you could be? 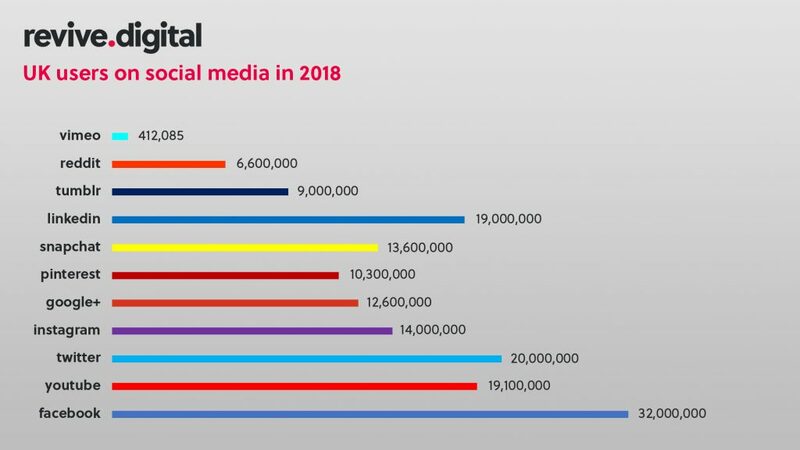 Below is the graph of the top social media networks with their UK user numbers. The largest is Facebook, with over 32,000,000 users in the UK alone – worldwide, there are 1.65 billion. Closely followed by Twitter (20 million), YouTube and LinkedIn (19 million). Due to their compatibility, Instagram and Snapchat have considerably less than Twitter/LinkedIn – as they are mostly used and compatible on handheld devices (Instagram can be viewed via a web browser). What Social Media Sites are there? What is the most popular social networking site? With a huge market on social media, more and more businesses are utilising social media to market products/services to the ever-growing audience. 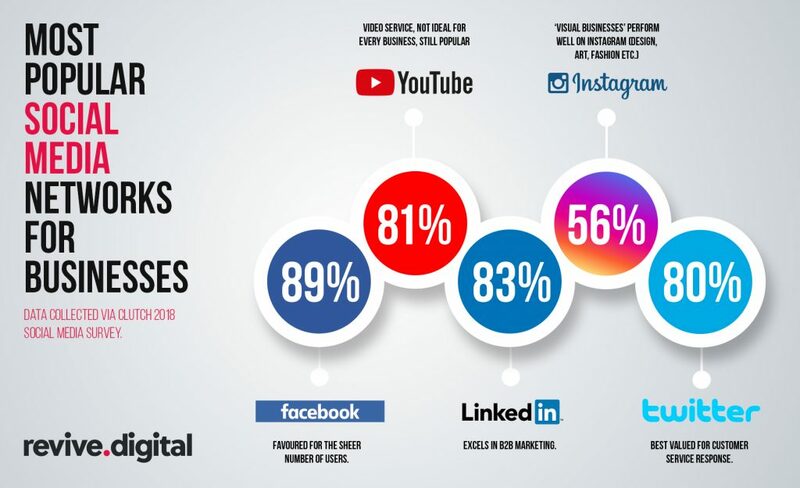 The most popular social networks for businesses, according to digital marketers, are listed below. Whilst smaller businesses may not have the scale for some services, like using Twitter for customer response, it’s surprising to see smaller businesses not taking advantage of LinkedIn. LinkedIn is a powerful tool for networking, which is a known and proven aspect for smaller businesses to bring in more business. If you’re a small business, and you’re not marketing yourself and your company on LinkedIn, you could be missing out on bringing in more work and more profit. Not everyone has a knack for social media. For some it can be confusing and a lot of hassle – especially if you’ve got your own work to get on with. Bigger companies will usually have an in-house social team. Generally, smaller businesses outsource to digital agencies and social media management companies. Managing multiple accounts is normally very time consuming, so social media whizzes use management tools like Hootsuite or Buffer. This allows you to monitor data from across all your social channels, as well as manage posts and track engagement and stats. Whilst there are tons and tons of services available, we’ve picked our top 3 favourite social media management tools. Hootsuite is one of the most well know management tools in the game. Plans vary depending on how many accounts you add, and you can utilise an array of features across the management system. The dashboard allows you to manage all your profiles in one location. The prices range from £16 a month (10 social profiles with 1 user) to £80 a month (20 social profiles with 3 users). Whilst Buffer focuses on ease of navigation. It not only looks simple but is easy to operate and comes with a wealth of reposts in the Analytics tab. Buffer offers a basic package for free, which allows you to manage Facebook, Twitter, Instagram and LinkedIn for free (1 account), and their prices for multiple accounts, for teams, start from $99 (£73.84). Whilst Sprout Social has no unpaid plan to utilise, its prices range from $99 and $149, for smaller packages, upwards to $249 for premium plans. Sprout is great value for money, despite not having a free plan. There are so many features available to ease the social media posting process. It allows you to queue up posts and visualise when and where they’ll be posted too. Whilst the hefty price tag may not suit smaller businesses, for larger scale ones it’s ideal. MavSocial has a special emphasis on creating strategic content campaigns, to utilise your social media in a more effective and efficient way. One of the key features is the re-purposing tool, which allows you to rework existing and published content to fit a new purpose, whilst monitoring your messages and notifications across all social profiles. The basic plan is free, with 2 social profiles and one user. The enterprise plan, for larger scale businesses, is around $199 per month. This plan allows you to have 50 social profiles with 5 users attached. This service is ideal for digital agencies, as it allows you to report to your heart’s content. AgoraPulse not only improves the content and streamlines posting, but it allows you to create unlimited reports too. This means you can report back to your clients, as well as integrate competitor analysis and monitor ad campaigns too – synchronising workflow. However, this is only available on the more expensive plans. The basic plan starts from around €49 per month, which allows 3 social profiles and 1 admin. The pro plans are around €299, with 40 profiles and 12 admins. Social Pilot works on creating harmony between all of your social accounts. It has the tools to create special tools for social media reporting. It emphasises synchronicity as the main feature, so the team of admins (on the pro account plan) can streamline their workload. The hand calendar feature easily displays published content and scheduled content as well. Starting from $10 a month, with 10 social accounts and 1 user, to $80 per month, featuring 200 social profiles and 20 users. As for Everypost, it focuses on pulling visual content from multiple sources as well as preaching a simple interface for ease of navigation and functionality. The price plan is dependent on the features you wish to include with your plan. Ranging from Free to around £73.84 ($99) per month. For the highest price on Everypost, you can have up to 120 channels with 12 people managing. Along with 15 social analytic profiles and 25 team members. It appears to be the best service for the price. For the same price as Buffer, and cheaper than Hootsuite, you can do a lot more with the service, including more team members and better management. So, if you want to maximise engagement for your posts, and schedule your socials accordingly, you should know when is a good time to post on social. We’ve created an infographic on the best times to post on 4 of the main social media platforms – so you can maximise users engagement and interactions with posts. You can see our graphic, below. With 2018 now here, it might be time to utilise all those social media platforms to their fullest extent. With each service gaining more and more users, Facebook is going to become even bigger this year. 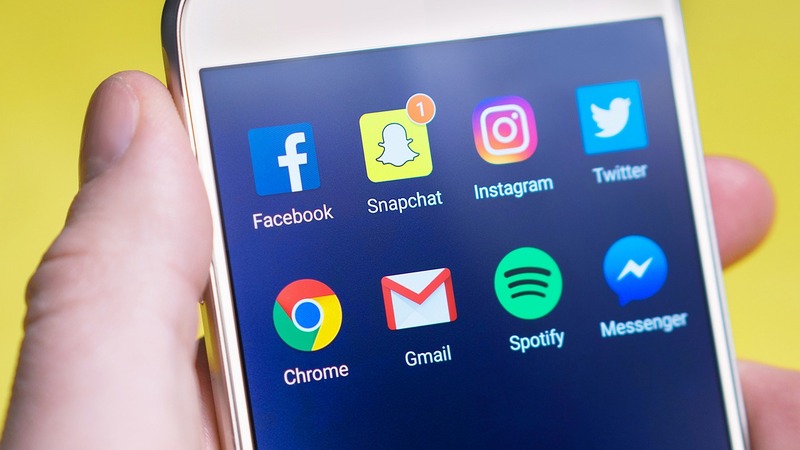 It’s a powerful marketing strategy to include SMM, and with a user base growing at an alarming rate, social media is not a market to miss out on. Refine your digital marketing in 2018, with Revive.Digital. Check out our digital marketing services available. Below, you’ll find a slideshow on social media management tools. If you find this information helpful, feel free to share it with your friends, colleagues, family or pets!